This insert is designed to be compatible with Dead of Winter. The same insert is also compatible with The Long Night. The design provides both efficient storage and improved game play. Many of the trays can be utilised during the game, and they greatly aid set-up and clear-away times. There is space for all cards to be sleeved. 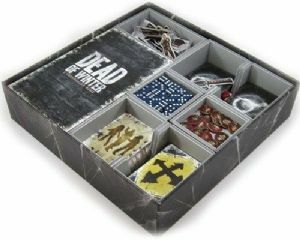 When the insert is used with the original Dead of Winter® game the survivor tray has four "legs" added, one to each corner, as shown in the image on the right. There is also a cross filler piece 1 cm deep which is placed under the zombie trays, as shown below. The location cards are then placed on top of the zombie trays as a lid, as in the main image at the top of the page. As noted above the insert is also compatible with The Long Night® game. Here you can see the same insert setup inside the game box. When the insert is used for The Long Night®, the thick location cards sit underneath (or on top should you wish) of the zombie and survivor trays. Note: when used for The Long Night® the zombie and other standees need to have the majority of their bases removed. This product consists of a flat-pack of 4 sheets. The trays require assembly, which is quick and fun, using ordinary PVA glue. Detailed instructions are included in the package. You will have to make tough choices, what might be best for the colony maybe not best for your own interests, while everyone is aiming to survive each group also has a secret objective. Dead of Winter - The Long Night is a stand-alone board game as well as an expansion for Dead of Winter. Players will be delighted to obtain more of everything that made Dead of Winter an epic struggle for power and survival. Additionally players will experience a new colony full of new survivors and some new gameplay elements, each of which is introduced to players through its own game scenario.